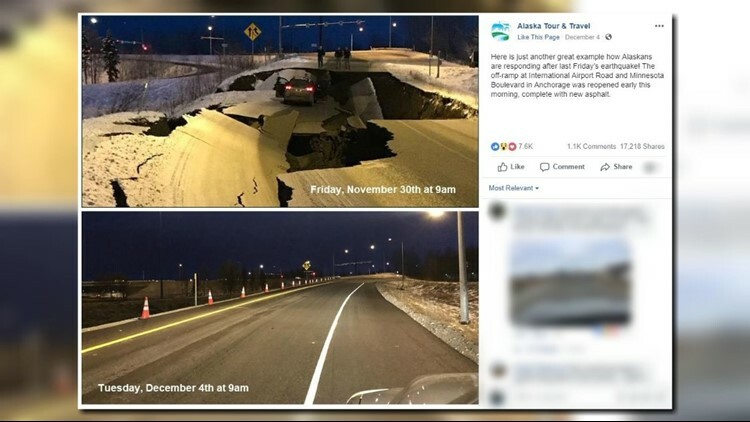 A powerful 7.0 earthquake hit Anchorage on Nov. 30, splitting roads, rocking buildings and at one point prompted a tsunami warning. ANCHORAGE, Alaska -- Two earthquakes in one day are still no match for Alaskans. A powerful 7.0 earthquake hit Anchorage on Nov. 30, followed by a 5.8 aftershock. The quakes crumbled roads, rocked buildings and at one point prompted a tsunami warning. One image posted to social media showed a car stranded on an island of pavement surrounded by pieces of the crumbled, caved-in road. That roadway is the off-ramp at International Airport Road and Minnesota Boulevard. By Tuesday, the road reopened, full repaired with new asphalt, Alaska Tour & Travel reported. The travel agency posted to Facebook side-by-side before and after photos of the road. It doesn't even look like two earthquakes hit just four days prior.